NASCAR Race Mom: What do Moffitt, Reddick, and Logano Have in Common? In a race that featured a minimum two cautions, both for planned stage breaks, Brett Moffitt drove away from the rest of the field after taking the lead from fellow Championship 4 contender Noah Gragson on Lap 99 of 134. "That was the longest 20-30 laps of my life," Moffitt said of the final run to the checkered flag. "Man, I was just glad we could get to the white flag without a caution and clean sailing. We had a great truck all day. "It's unreal. We all know the story by now. We didn't know if we were going to race this whole year. I didn't if I would have the opportunity to run for a championship, even after we got our first win. Everyone pulled together hard here. November 17, 2018 in Homestead, Florida. 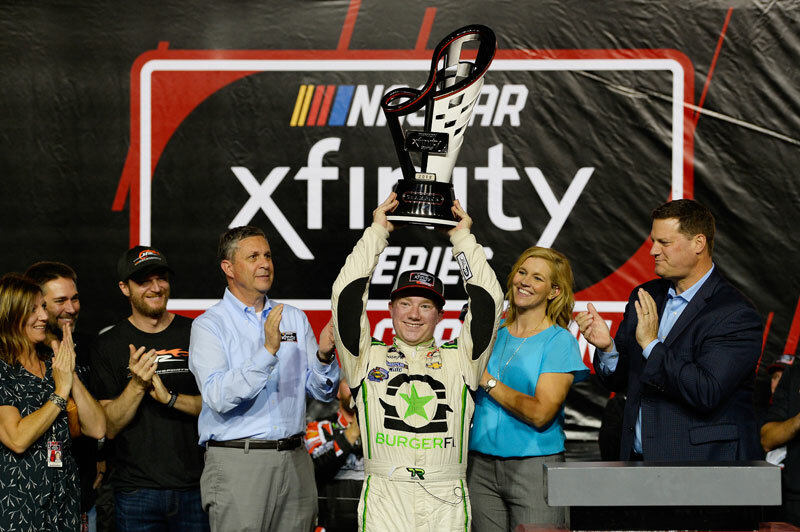 Tyler Reddick was the only driver of the Championship 4 who really liked it on top, and his willingness to run the wall paid off with a race win and a NASCAR Xfinity Series title. "I picked a really good time to get my life together and decide to win a race," and elated Reddick said in Victory Lane. "I just knew we had to execute," Reddick said. "I thought we had a chance if we just made it to Homestead. I like this track—it rewards my aggression. Tonight, we hit the wall a lot, but the car kept in one piece, enough for me to get to the end." "He went out and attacked, attacked, attacked all night, and it paid off for him," Bell said of Reddick’s effort. "I was good on the bottom, and I had glimpses of hope, but we just weren’t fast enough." On Sunday night at Homestead-Miami Speedway, it was "The Big Three and Me" — with the "Me" being Joey Logano waging vehicular war against the three most prolific winners in the Monster Energy NASCAR Cup Series. Now "Me" is a champion. 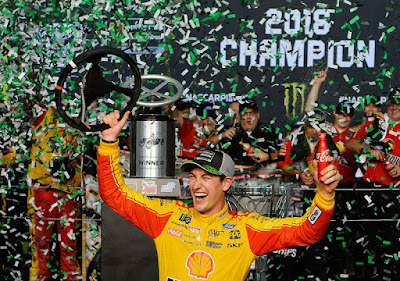 In a thrilling finish that featured all four Championship 4 drivers battling for the race victory and the title—and finishing 1-2-3-4 in the Ford EcoBoost 400—Logano charged past defending series champion Martin Truex Jr. on Lap 256 of 267 and pulled away to win his first championship. "Oh, my God, yes!" Logano screamed on his radio as his No. 22 Team Penske Ford flashed across the finish line 1.725 seconds ahead of Truex, establishing a handful of milestones in the process. "We did it! We won the championship! I can’t believe it. I don't know what to say. This team, (owner) Roger Penske, (crew chief) Todd Gordon, the pit crew. Oh, my God! They gave me the car I needed at the end to do my job. Put me in position to do my job. I couldn’t be more proud of them. We won the championship! Oh, my God!" Promise fulfilled. 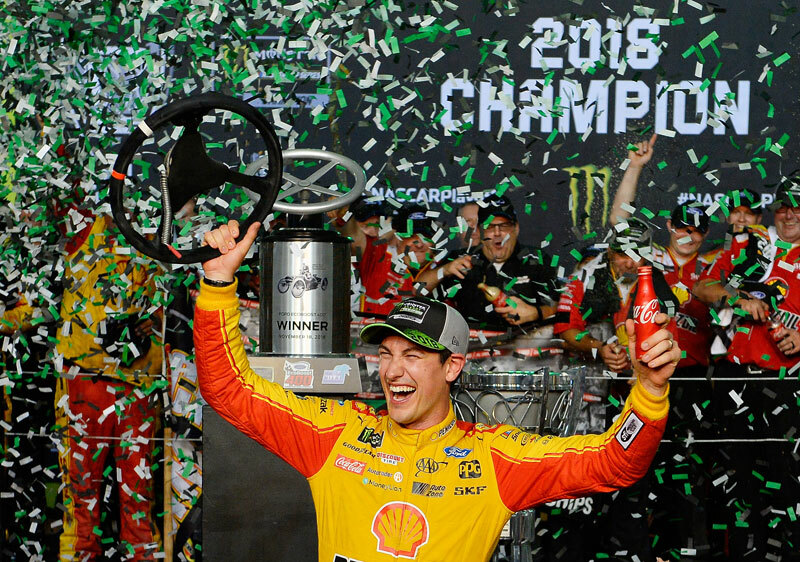 @joeylogano is a champion!